Mix together the Whole Cranberry Sauce, olive oil, vinegar, garlic, jalapeño and cayenne in bowl; whisk until well mixed. Place turkey in resalable plastic bag; add cranberry mixture. Seal bag and turn to coat. Refrigerate for at least 30 minutes. Preheat a griddle to medium-low heat. Griddle the turkey for about 6 -8 minutes or until no longer pink inside, turning during cooking. Remove from griddle and cut into bite-size pieces; set aside. Increase griddle to a high heat. Lightly brush one side of each tortilla with vegetable oil. Place on the griddle, oil side down. 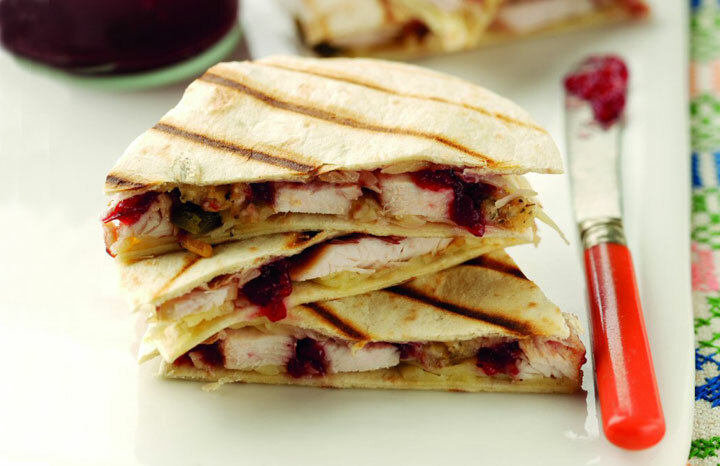 Sprinkle with a thin layer of cheese and top evenly with cooked turkey. Add several tsps of remaining Whole Cranberry Sauce and the stuffing evenly on each. Top with a little more cheese. Brush another tortilla with more oil and place oil side up over the filling. Flip over and cook for a further 2 to 3 minutes or until cheese is melted and other side is crisped. Repeat with the other tortillas and filling. Serve hot.